It pre-dates Christianity by around 1000 years, and for much of its history has been associated with the Islamic world. 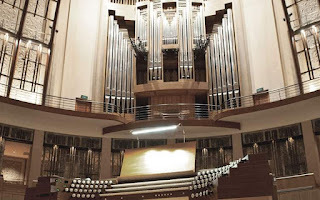 But for most of the last 400 years the pipe organ has been regarded as the almost exclusive property of the church, so it fully justifies its place in the Esplanade’s annual Tapestry Festival of Sacred Music as the musical representative of the Western Christian Tradition. 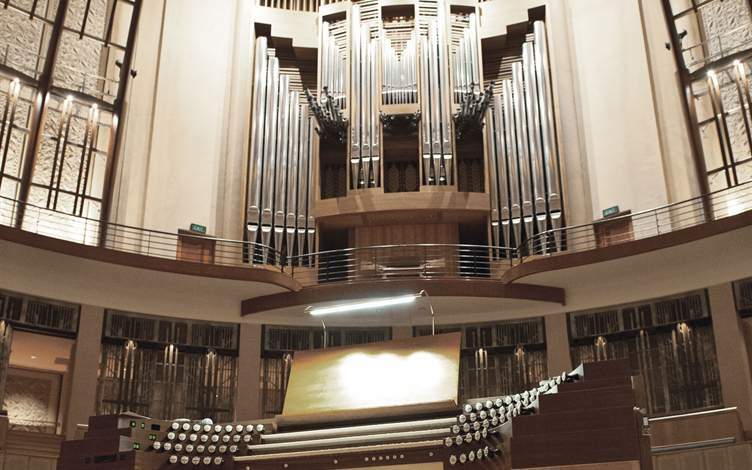 This year it fell to Michael Hey, the Assistant Director of Music at St Patrick’s Cathedral New York, to blow the dust and cobwebs out of the under-utilized pipes of the great Esplanade Klais organ. And he did it with great relish, spicing things up with a wonderfully easy stage manner in which he found himself as often as not in dialogue with a particularly loquacious member of the audience. He did not have the stage entirely to himself, either. Rebecca Li appeared, a shimmering vision in what might best be described as a cardinal’s scarlet, to sing Mozart’s Laudate Dominum and Schubert’s Ave Maria. In the Mozart problems of coordinating a single human voice at the front with thousands of inanimate pipes perched high above the back were obvious, but with the Schubert she was completely in her element and delivered a warm, ravishingly expressive performance which we could have happily heard again. Certainly a repeat of the Schubert would have been preferable to the solid indigestibility of Reger’s gargantuan “Hallelujah” Chorale-Fantasy. I’m not sure Reger’s organ music should be let loose on an unsuspecting audience at any time, let alone on a hot Sunday afternoon. Despite Hey’s brave attempts to cut a path through its thick and impenetrable jungle of notes by judicious use of organ colour and some sprightly foot-work, the only pleasurable moment came when he pulled out most of the stops, and rested his fingers and feet on one massive chord in a powerful celebration of finality. He also tried to lighten Bach’s somewhat heavyweight G minor Fantasia and Fugue with imaginative registration and flutterings of the swell pedal. This could have sent purists into paroxysms of rage, but it did much to captivate the Singapore audience. Best of all, he gave a glittering performance of Bach’s Wachet auf. It was crisp, clean and enticingly communicative. A scintillating account of Scherzo Symphonique by the French composer Pierre Cochereau afforded Hey the opportunity not only to display his tremendous virtuosity but also his fluent command of the instrument, as stops were pulled out and pushed in in a kaleidoscopic demonstration of the organ’s colours and qualities. What a shame this opened the recital; it would have been the perfect climax to a sweltering afternoon which, despite sparkling sunny intervals, had sometimes seemed dangerously oppressive.